"WONDERFUL!!! 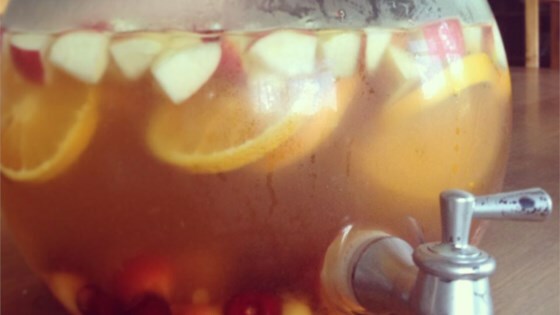 A wonderful punch made with white wine, mango and orange slices. Peach schnapps, cognac and ginger ale round out this summer party drink." In a pitcher, combine peach schnapps, cognac, sugar, sliced oranges and sliced mangos. Chill for at least an hour. This is a fantastic recipe! Served it at a bridal shower and it was a real hit. I did add red raspberries just because they looked so pretty. Next time I will make double! Amazing! I made it for a picnic last weekend and got rave reviews from everyone. Will definitely make again.